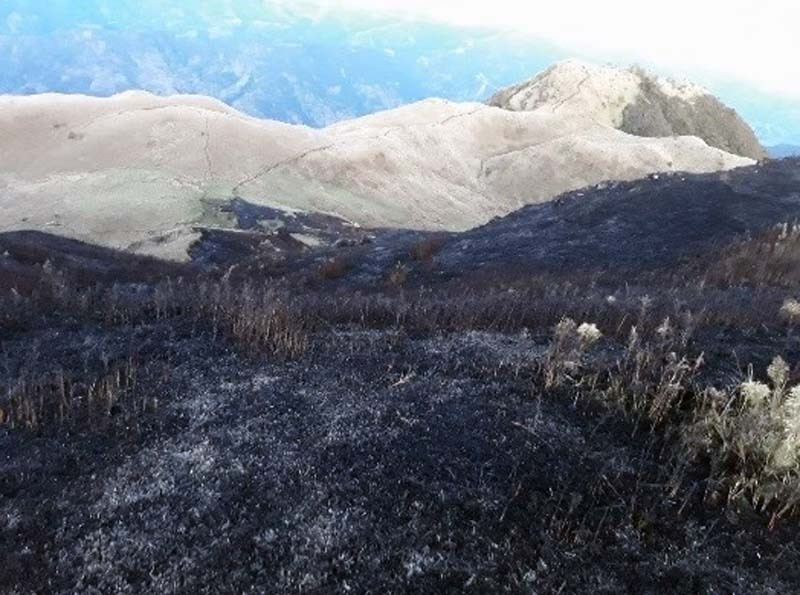 This file photo shows damage on Mount Pulag after a brush fire in January 2018. BAGUIO CITY, Philippines — More than 140,000 hectares of forest in different provinces in the highland Cordillera have been ravaged by fire in the first three months of 2019. The Bureau of Fire Prevention in the Cordillera said there have been an "alarming" 90 incidents of forest fire from January to March, up from 87 in the same period last year. Around 151 forest fires that affected over 20,880 hectares of forests were reported in 2018, up from 64 forest fires in 2017 that damaged more than 13,509 hectares forest. In 2016, BFP-CAR recorded 178 forest fire incidents that damaged over 6,100 hectares of forest reservations. Senior Superintendent Maria Sofia Mendoza of BFP-Cordillera said there is an added risk of fire because a dry spell that is characteristic of the El Niño weather phenomenon. "We do not want more fires but we have to brace ourselves and prepare, because we have had no rain this year," the fire official said at the start of March, which the goverment designates as national fire prevention month. On February 20, four foresters of Philex Mining Corp. and an elderly resident were killed in a blaze that hit at least six hectares in a forest area that straddles Itogon and Tuba towns in Benguet. At least seven forest fires have already been recorded in Sagada, Mountain Province. The most recent fire gutted six hectares of forest in Barangay Aguid on February 21. The Spanish trail leading to Bauko 7 Peaks and the Usan trail leading to Mount Bato in Bauko town in Mountain Province have been off limits to tourists since after a fire destroyed portions of Mount Am-o that straddles Bauko and Tadian town on February 20. The fire at Mount Am-o, a watershed, started on February 17 and raged until February 22, killing a farmer from Tadian town. To date, more than 50 hectares of forest in various areas in Bauko have been razed. A large portion of the Mount Data watershed is located in Bauko. The recent creation of a task force against environmental crimes in the Cordillera would be of great help, the BFP said, in addressing the perennial forest fire problem. The task force will be co-chaired by the BFP and the Department of Environment and Natural Resources. Mendoza said the BFP lacks equipment and personnel to fight forest fires but the task force is expected to provide reinforcement. She said they would also rely on climate change and weather data from the Philippine Atmospheric, Geophysical and Astronomical Services Administration to address the problem. Mendoza also called on people living in communities near forests or within watersheds to be extra careful in the disposal of items like lit cigarettes that could trigger fires that pose a serious threat to the region’s environment. Mendoza said that open burning, lighted cigarettes and unattended fires have been a major cause of fires in recent years.